Medicine is becoming increasingly specialized all for the benefit of the patient. With that said, the back pain or neck pain sufferer often has to navigate a confusing array of spine doctors, some sadly providing state of the art spine care circa 1970 when they completed their medical training. Consequently, it is crucial for the back pain sufferer to understand: who YOU choose as your spine physician will determine the quality of healthcare you will receive. It’s important for the patient to understand that your choice of spine physician will determine the quality of healthcare you will receive. Fact: There have been many advances in the field of spine care over the past 10 years. But that does not mean every spine physician is using the most advanced approach. That’s because it takes a great commitment of time and training for a surgeon to learn to operate through instruments the width of a ballpoint pen and a one-inch incision. It’s much easier for a surgeon to simply make a three-inch open incision. But there is great benefit for the patient to have a one-inch incision. There is less blood loss and no need for donated blood. Because the incision is shorter, there is less disruption to muscles and ligaments so your recovery is much faster and less painful. With minimally invasive spine surgery and a one-inch incision, many patients are able to go home the same day and are back to activity in a far less time than with a larger incision. Dr. Michael Rohan, Jr. is fellowship-trained in spine surgery, the highest level of medical education in the U.S. His fellowship was done at the prestigious Texas Back Institute, which in 1986 was the first and largest spine specialty center in the United States. During his fellowship, Dr. Rohan, Jr. specialized in minimally invasive spine surgery techniques that require the surgeon to operate through a one-inch incision using tubular retractors with tiny cameras and cutting devices in the tip. Dr. Rohan, Jr. founded Northwest Florida Spine 10 years ago, as one of the first spine surgeons to bring these new minimally invasive spine surgery and artificial disc replacement techniques to the Panama City region as a long-overdue alternative to traditional 3-inch long incisions that were common in the region. Consequently, Northwest Florida Spine over the years attracted hundreds of patients and referrals from across the Northwest Florida Panhandle region, from Mobile, Alabama; Fort Walton Beach; Pensacola; Destin; Miramar and to the east Tallahassee and Dothan, Georgia to the north. Responding to its regional reputation in spine care, in early 2018, the spine center transitioned its name from Northwest Florida Spine to Northwest Florida Spine which reflects the regional draw of patients. Currently, the spine specialty center is referred back and neck pain patients from across the Gulf Coast who can are looking for the most advanced minimally invasive spine surgery, motion preservation and artificial disc replacement surgery. We recognize that those with back pain or neck pain often struggle to find a back doctor or spine center that can provide a second opinion for spine surgery and offer nonsurgical treatment for back pain, neck pain, scoliosis (curvature of the spine) and pain symptoms related to a herniated disc. We provide this content-rich informative Internet presence to help the person wth back pain gain a better understanding for the most advanced treatment alternatives for a herniated disc and other complex spine problems. 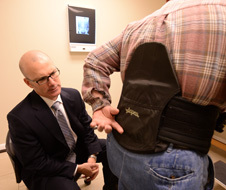 Each year, Dr. Michael Rohan, Jr. at Northwest Florida Spine is referred back pain and neck pain patients from across the Gulf Coast, including the Florida Panhandle, Southern Georgia, Southern Alabama, Pensacola, Tallahassee, Destin, Fort Walton and as far away as Mobile, AL. "We emphasize non-surgical treatment options where possible, including therapy and spinal injections,” Dr. Rohan explains. "However sometimes symptoms can progress to radiating pain into an arm or leg. Other red flag symptoms include numbness or weakness in a leg or arm. If this type of neurological deficit is not treated promptly, these symptoms can become permanent." Dr. Rohan notes that the spine center uses the newest minimally invasive spine surgery techniques and instrumentation. While this can involve more training to operate through a tiny half-inch incision rather than an open 3-inch long incision, the benefits are huge for the patient, Dr. Rohan explains. A tiny incision means less disruption to muscles and ligaments and a quicker, less painful recovery. Consequently, most patients can have their spine surgery in the morning and be home later the same day to recover in the comfort of their own home. Also less blood loss eliminates the risk of having to use blood from a blook bank. "We recognized that for those in the gulf coast region, there is a need for a spine program that uses the newest minimally invasive instrumentation," explains Dr. Rohan. "The smart patient should look for this expertise. In the past, they had to drive 300 miles. Now it is closer to where they live." Even instrumentation, screws and plates can often be inserted through smaller incisions. As a community service, the spine center distributes a free 36 page Home Remedy Book on back pain. 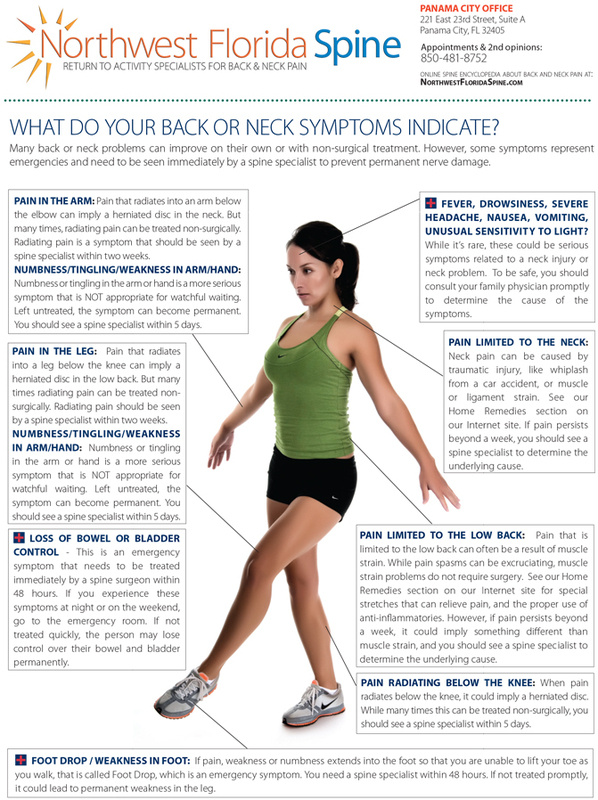 Recognizing that the best quality healthcare comes from a well-informed health care consumer, Northwest Florida Spine created this online encyclopedia about back and neck pain at NorthwestFloridaSpine.com with symptom charts and stretches that can relieve symptoms. This educational Internet site on spine care is the most content-rich resource for any spine program in the State of Florida. In addition, Northwest Florida Spine produces a 16-page educational Back to Life Journal that provides home remedies for back pain, neck pain and other spine problems. At some point in their lives, 80% of Americans will have an attack of back pain or neck pain. Worse, once you have your first back pain attack, you are four times more likely to have a recurrence. That's the bad news. The root issue, however, is that for common acute back pain symptoms that do not involve nerve damage (numbness, weakness or pain in an arm or leg) physicians don't know for sure which patients will respond to non-surgical treatment options, and which problems require more invasive treatment, such as spine surgery. Consequently, the best spine care exhausts non-surgical treatment options for back and neck pain before spine surgery is considered. With back and neck pain so widespread, often those with back pain symptoms will make trips to multiple locations: a chiropractor office, to their family practice physician, who then refer the patient with persistent symptoms to a spine surgeon. For the person with an aching back, the journey to multiple locations to suffer through a variety of conflicting opinions and treatment plans can be a major headache on top of a backache. Because spine specialists are often spread across towns or regions, there is typically no communication between them about a specific patient. This means that a patient will often travel from doctors office to doctors office, having to start from scratch with his or her story to build a new medical chart from scratch. Thirdly, because non-surgical treatment options are poorly designed, it predestines the patient to failure of conservative non-surgical care. And when non-surgical options fail, this forces the patient to resort to surgery, in many cases, unnecessarily. An unnecessary spine surgery can unfortunately just create a bigger nightmare for the person, as scarring around a nerve root from surgery can create failed back surgery syndrome, which is worse than any original pain symptom. Northwest Florida Spine emphasizes nonsurgical treatment options like spinal injections that can relieve the symptoms of a herniated or bulging disc. Through the use of an epidural steroid injection, the spine specialist is able to reduce inflammation around a nerve root. This in turn can relieve the symptoms of radiating pain into a leg or arm, or deficit (weakness or numbness in a hand or foot). Northwest Florida Spine is affiliated with spine specialized physical therapists that excel at treating back and neck pain. One of the only way to permanently relieve pain involves changing the physiology of the back by using exercise to make it stronger, more flexible and resistant to injury. When all nonsurgical treatment options fail to provide relief of symptoms, we emphasize minimally invasive spine surgery which shortens the incision, reduces time in the hospital, lessens pain during rehab, and speeds the return to activity and one's work. Sometimes, spine surgery is the right treatment. This may occur because symptoms of radiating pain have not responded to non-surgical treatment options like injection therapy or customized spine physical therapy. In other cases, some symptoms like weakness or numbness in a leg or hand, or loss of control of bowel or bladder, represent emergency symptoms where back or neck surgery must be done quickly to prevent permanent paralysis of the nerves that relate to these muscles or extremities. Some procedures, such as the microdiscectomy, can be performed as an outpatient surgery where patients go home the very same day. We recognize that those with back pain or neck pain often struggle to find a back doctor or spine center that can provide a second opinion for spine surgery and offer nonsurgical treatment for back pain, neck pain, scoliosis (curvature of the spine) and pain symptoms related to a herniated disc. We provide this content-rich informative Internet presence to help the person wth back pain gain a better understanding for the most advanced treatment alternatives for a herniated disc and other complex spine problems.